When the temperatures and humidity start to climb during the summer months, we naturally seem to feel thirstier. It is very important to give our bodies plenty of fluids and nutrients, especially during this time of year. The trick is to choose quality, nutritional drinks that don’t subject us to harmful substances and/or pack on empty calories. We’ll discuss some ideas for healthy drink alternatives, but first let’s lay a few ground rules about what not to take into our bodies. Soda pop is the “all-American” drink to reach for, at least that’s what the mainstream media and advertisers want us to believe. My advice is to take carbonated soft drinks off your grocery list and leave them off permanently. Unless, of course, you want to gain weight, weaken your bones, wreak havoc with your digestive system, and expose every organ in your body to toxic chemicals. Oh, and as a side note, pop doesn’t quench your thirst well; it only makes you thirstier. A second general guideline is to avoid the over use of caffeinated beverages and alcohol. Both of these are poisonous to your system, and they also lead to dehydration, a bad thing anytime, but especially during the dog days of summer. Okay, so we know what not to drink. What are some good things that we should drink? Pure, filtered water is hands down the best way to quench your thirst. The body — both on a cellular and systematic level – is composed of over 70% water. We need lots of it in order for us to operate the way we’ve been designed. The health benefits of drinking plenty of water are numerous (weight loss, strong immune system, younger-looking skin, better nutrient-absorption and toxin elimination, etc.). There is no better beverage than water when you are thirsty. I know some of you may be bored with plain old water, although your body will develop an increased desire for it if you drink it consistently. Here are a few healthy tips about making water a little more tasty and palatable. Try a teaspoon or so of organic apple cider vinegar (ACV) in a glass of water. It gives it a bit of a bite taste-wise, but beyond that ACV provides a ton of healthy benefits such as boosting your digestive and immune systems, reducing acidic imbalance in the body (a major contributor to disease), and combating free radical damage. 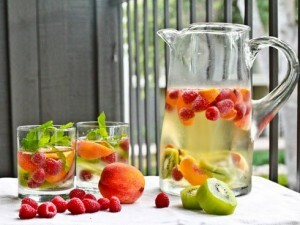 Fresh fruit-infused water is not only flavorful but also healthy. This has its roots in Spanish cuisine and is known as aguas frescas. Adding fruit and/or vegetables and herbs will make the water more interesting, and expose you to the vitamins and minerals of the fruit without excessive amounts of sugar. A simple twist of lemon or lime also adds flavor, or you may want to grab a few mint leaves (preferably from your own garden) and spice up your water in this fashion. Bruising the leaves helps to release the flavor. There are so many varieties to choose from, that you are sure to find a flavor that tickles your fancy. Most are caffeine-free, and provide minerals, antioxidants, and other useful nutrients and benefits. Just be sure to stay away from simple sugar which is high in calories and terrible for your overall wellness, and of course you should avoid toxic artificial sweeteners. Stevia is your best choice for a natural sweetener. If you like a bolder taste, try using organic blackstrap molasses in your tea. It has a rich, strong flavor, so go easy on it. However, molasses is also a great source of minerals such as calcium and iron, and is actually a whole food-based sweetener that nutritionally builds up the body unlike simple sugar which tears it down. Another suggestion is to make fruit-infused herbal teas. Make this the same was as the fruit-infused water except substitute herbal tea for the water. Be creative with the different types of teas and fruits that you put together. There are endless possibilities in making a very healthy drink. Organic cottage cheese and/or yogurt. Whole foods such as freshly ground flax seeds or nuts. Natural, organic protein powder such as hemp seed or pea protein. Potassium-rich foods such as organic bananas, apricots, oranges, or raisins are particularly helpful if you are highly-active in the heat (great for preventing dehydration and muscle cramping). Milk substitutes such as hemp seed milk, rice milk or almond milk (soy-free or make your own).